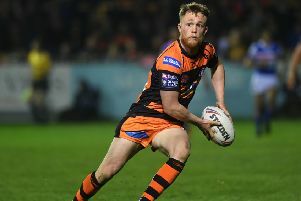 Castleford Academy are on their way to Wembley yet again. Castleford Academy continue to be top of the class when it comes to having teams reaching the RL Champions Schools National finals. Castleford year 11 boys have already played their final and the year seven and 10 boys teams and year seven, nine and 10 girls sides will play their finals in London over the August Bank Holiday weekend. Castleford are the most successful school in Champions Schools history, with 62 teams reaching national finals in 13 years. Castleford year seven boys will again be in action in a Wembley curtain-raiser. Their final will be played shortly before the Ladbrokes Challenge Cup final on Saturday, August 26. It will be Castleford Academy’s seventh appearance at the new Wembley Stadium since 2007. With the weekend in London costing a substantial amount of money, Castleford Academy are organising various fund-raising events this summer.